She was Bermuda’s answer to the “Unsinkable” Molly Brown—and like that heroine of the Titanic sinking, Edna Watson demonstrated gallantry and indefatigable determination when a Bermuda-bound aircraft she was aboard crashed in the chilly North Atlantic in 1939. Born in Montreal but a Bermuda resident for most of her life, guesthouse operator Mrs. Watson was one of 13 crew and passengers aboard the British flying boat Cavalier when it went down while en route to the Darrell’s Island airport from Port Washington, New York. The luxury aircraft had gone into service in 1936, the first of the S23 series of Empire flying boats manufactured by Britain’s Short Brothers. The S23 flying boats could carry five crew, 17 passengers and 4,480 pounds of cargo at a maximum speed of 174 knots. But the Cavalier was forced down on January 22, 1939, when ice formed on the engines’ carburetors. Three people aboard were killed on impact. Ditching two hours into its five-hour flight to Bermuda, the Cavalier went down almost 400 miles off the island—prompting a massive search for survivors by both the US Coast Guard and Navy. Mrs. Watson rescued the aircraft’s commander, Captain M.R. Alderson, from the shattered 19-ton fuselage before it sank and kept him afloat when he became semi-delirious and later lapsed into unconsciousness. 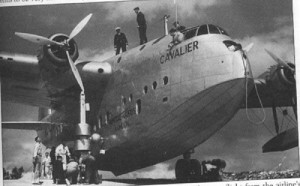 Clinging to life preservers—the Cavalier‘s operator Imperial Airways was later criticised in the official UK inquiry into the accident for having no life rafts aboard—the survivors drifted in frigid waters for 11 hours before they were spotted and rescued by the steamer Esso Baystown. “When the plane struck the water, I was almost immediately taken by the steward to the emergency door in the pantry,” Mrs. Watson later recalled. “By the time the steward had the door open, the water was already pouring in and the floor of the cabin was knee-deep in water. I literally had to step out into the ocean. “The plane sank in about 15 minutes, not fast, you know it just settled slowly. We had climbed on top and the men pulled the injured men up. Mrs. Watson said although the survivors had lived through an aircraft crash in the open seas, they feared they might not be as lucky given a new peril they potentially faced: sharks. “My next recollection was of swimming and holding on to a life belt,” she said. “We formed a sort of ring, holding up the ones in between who seemed to be weaker. One ship passed the survivors without spotting them, recalled Mrs. Watson, who was one of three Bermuda residents aboard the Cavalier along with Mrs. Catherine Ingham and Miss Nellie Tucker Smith. The surviving passengers eventually reached Bermuda—by sea. A week after the Cavalier crashed, they boarded the luxury liner Monarch of Bermuda in New York and sailed to the island on its regularly scheduled service. Outgoing Bermuda’s Governor Sir Reginald Hildyard—he had resigned his post when the House of Assembly refused to allow him an official automobile—bestowed a medal for heroism on Mrs. Watson at a military ceremony in August, 1939. Mrs. Watson went on to a distinguished career of public service in Bermuda, becoming one of the island’s first two female Members of Colonial Parliament in 1948 and later helping to establish the Committee of 25 for Handicapped Children. She died in 1976 just weeks after Captain Alderson, the man she rescued, visited her on the island.